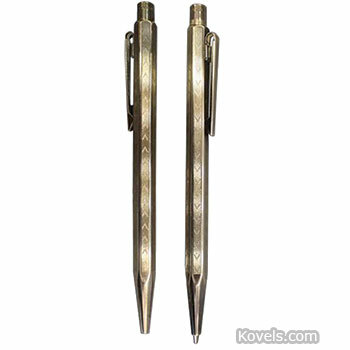 Pens replaced hand-cut quills as writing instruments in 1780, when the first steel pen point was made in England. But it was 100 years before the commercial pen was a common item. The fountain pen was invented in the 1830s but was not made in quantity until the 1880s. All types of old pens are collected. Float pens that feature small objects floating in a liquid as part of the handle are popular with collectors. Pencils were supposedly invented in 1565, the eraser added in 1858, and the automatic pencil invented in 1863. Advertising pens are listed in the Advertising section.